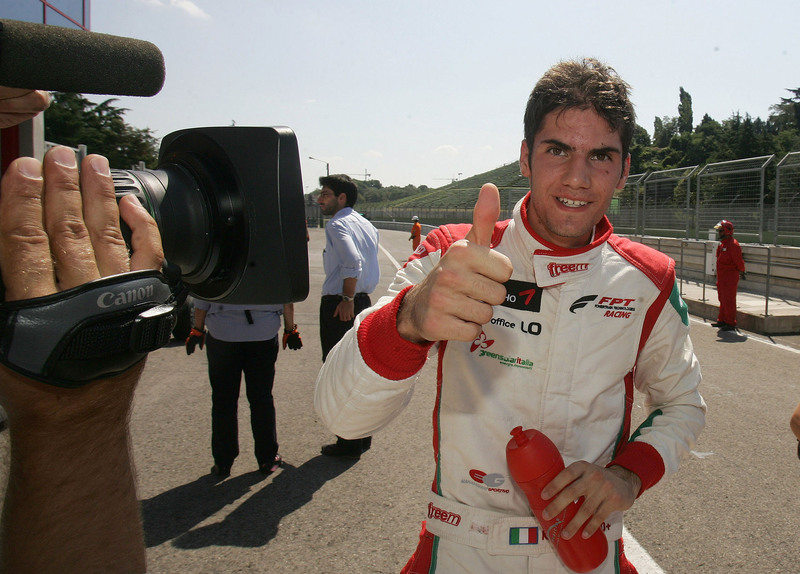 17/07/2011 - Started from the pole position lined up by the top eight grid inversion of qualifying, Kevin Giovesi secured the victory of race two in the third round of the Italian Formula 3 Championship. The Milanese driving for Lucidi Motors, obtained his first success during the second season in the series by getting the lead from the beginning and managing a small advantage with great determination from Brandon Maisano’s attacks. The French driving for BVM-Target, after a better start than his fellow-student in the Ferrari Driver Academy, the Swiss Raffaele Marciello (Prema Powerteam), gained the slipstream of the leader and tried in several occasions to move an attack. Maisano was definitely faster in the last sector of the circuit and always moved attacks at the Tamburello and became more and more incisive until the middle of the race when due to an error he lost some ground to Giovesi that managed to cross the finish line in first position even with less than 7 tenths from his closest rival. The fight for the first position favoured the recovery of Sergio Campana, who has been author of a good start with which he gained the third place even if with an important gap from the leading couple. The Modenese driving for BVM-Target started to hunt the first two drivers during lap 11 when he was author of the fastest lap of the race and managed to get back on to the gearbox of Maisano without managing to move the successful overtaking before the chequered flag. The battle for the fourth place was fought in the beginning of the race when Marciello, pressurized by his team mate Michael Lewis, went wide at the Tamburello during lap five and gave the position away to the Californian that obtained once again points in the championship and gained the third place of the rookies classification. Important points were also harvested by the championship leader, Edoardo Liberati (Team Ghinzani), that ended race two in fifth place right ahead of Marciello and Eddie Cheever (Lucidi Motors) with the latter recovering from the last position of the grid occupied due to the retirement in the formation lap during race one. Behind him, the duel between Victor Guerin (Lucidi Motors) and Daniel Mancinelli (RP Motorsport) for the eighth position was solved only in the last lap when the Brazilian managed to stay in front in the last few meters of the race. The top ten was completed by Andrea Roda (Prema Powerteam), Federico Vecchi (LineRace-CO2 Motorsport), Niccolò Schirò (RP Motorsport) at his debut, Simone Iaquinta (Downforce Competition) and Luca Marco Spiga (GTR Racing), while Maxime Jousse’s (BVM-Target) race ended in the first lap when he was pushed into the wall at Tamburello by Facu Regalia (Team Ghinzani) that hit the kerb and centered his rival before retiring due to the failure of the right front wheel. Liberati strengthened his classification leadership with 64 points but Campana (52) is now second, then Lewis (43), Giovesi (42) and Maisano (41) follow. The next round of the championship is scheduled on the Belgian circuit of Spa on the weekend of the 8 August in what will be the only round out of the Italian borders of the Italian Formula 3 Season.